The traditional bowhunting community has bestowed numerous gifts upon me over the years, most are more spiritual in nature. A kind gesture, an offer of assistance, a bowhunting tale or a campfire yarn. Yet, perhaps some of the most special gifts I have received are those of friendships. I have made quite a few along my traditional journey. This story begins in March of 2017. I was invited to participate in an annual hunt that takes place along the Savannah river basin of South Carolina. This particular hunt is known as “Camp hAmbush” by the annual participants. The real bonus for me was the good fortune to share in the birthday of my good friend, Thom Jorgensen, which happened to occur during this hunt. Over the course of that week, we shared many stories and laughs from adventures past. Thom and I even managed to spend a few mornings still hunting together through the swamps. As luck would have it, I took my first spot-and-stalk hog while still hunting through the swamps with Thom that week. While I did not know it at the time, this would be the last camp I would share with our close mutual friend Andrew Harper. Andrew would be taken from us prematurely later in the year in a swimming accident. For so many reasons, this ended up being a hunt I will never forget. On the last day of the hunt, Thom and I were lounging in the bunk house discussing the week’s events. Soon we were discussing future hunts and mainly his planned hunt to Africa later in the year. During the conversation, Thom pointed towards his gear lying neatly in the corner. 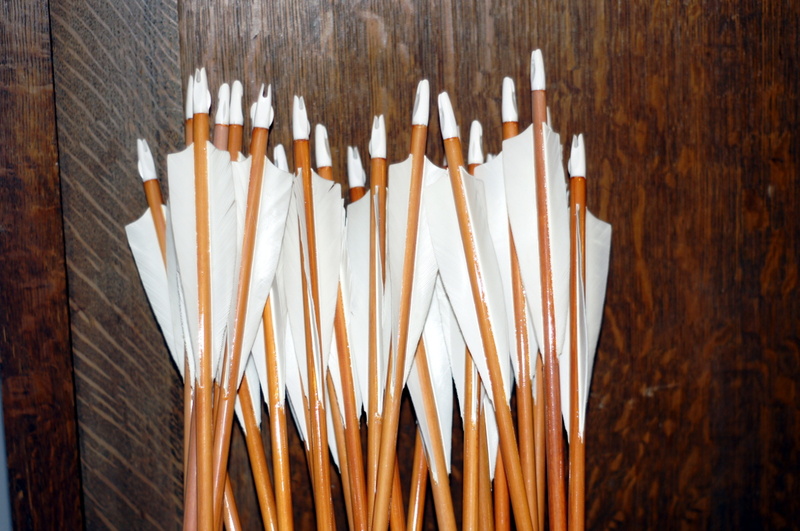 There, along with his normal gear, was a huge collection of wood arrows and arrow shafts. I had spied them during the week but at the time did not know if Thom had brought them, or if perhaps one of the other members of camp had brought them. Thom explained that he had acquired these shafts over many months. He had been on a quest for a wood arrow that would meet his strict expectations for tuning and performance. The quest had not been a fruitful one, and he had decided that carbon shafts were what worked best for him. He followed up with how they were all heavy-spined, and he was sure I could find a use for them. With that, in typical Thom fashion, they were now my property. Thom just has a way of saying things in a manner that seems to make things “fit”. So, into the truck they went, and Thom seemed happy to have one less thing to try and bend to his will. Flash forward several months. I am attending our local Traditional Archery club’s monthly 3D shoot. Another good friend, Beecher DuVall, comes up to me and greets me with the customary handshake. Beecher is one of those people that has never met a stranger. He has a personality that draws you into his company. I always make a point to have a lengthy chat with him every chance I get. We talked for several minutes, and he asked me to accompany him to his vehicle. He reached into the back and hauled out what appeared to be a gray, woolen bow sock. However, it is only about 30” long, and I am not sure what he is about to show me. He hands it to me and in a matter-of-fact manner states: “This should belong to someone who will appreciate and shoot it.” I opened the sock to find a beautiful two-piece longbow crafted by Jay St. Charles. Mr. Duvall explained that he acquired the bow as part of a trade and that the 69 # was just too much for him. He knew that Jay and I were good friends. He also knew I loved shooting Jay’s bows and leaned towards heavier draw weights. Just like that, the 64” Pacific Yew beauty was mine. He would not discuss any trades or money, and I left him with “I will definitely take a deer with this bow come fall”. A few months later and it is a crisp, late-October morning not yet touched by the light of day. I am sitting in my stand in the pitch-black darkness waiting for the first glimpse of light. I always enjoy the mornings when I arrive to my spot earlier than normal. Surrounded by darkness, void of the visual distractions that derail attempts at inner reflection. On mornings like this, I have nothing but my thoughts and the anticipation of what the day may bring. Soft sounds surrounded me. I could hear a breeze rustling the leaves. I heard the faintest murmur of water cascading along rounded stones in the small creek below me. Now and then, I would hear the thump of an acorn as it settled on the forest floor. My thoughts turned to a hunting trip in Michigan with good friends just a few weeks away. I am not sure how long I contemplated my mental check list for the hunt before a rustle in the leaves above me and to my left startled me from my thoughts. A squirrel was waking up, and I realized the sky had turned from black to a soft, faint blue. On a sawed-off limb to my right hung “Wapiti”, the two-piece take down longbow. 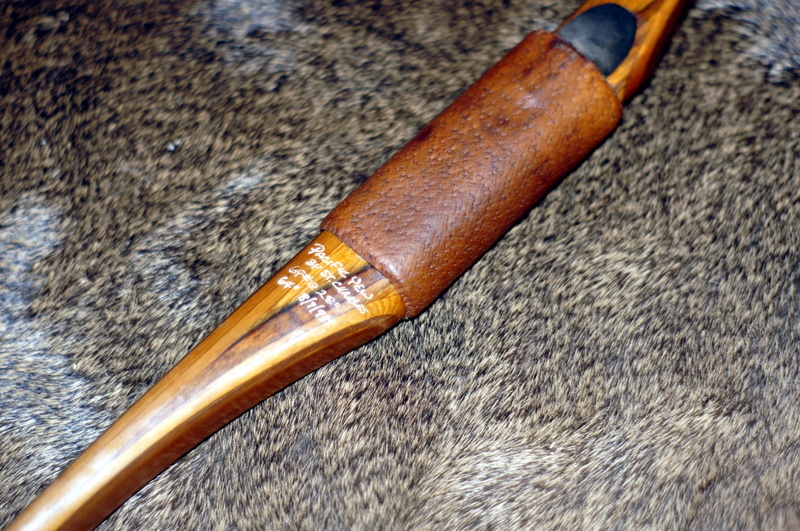 Inside the quiver are two “Superceeder” wood arrows from the pile of shafts Thom had given me back in March. I pulled the leather glove from my pocket and slipped it onto my fingers. Next, I retrieved the bow and placed it onto my lap and nocked an arrow. For me, hunting is mostly a private matter. Today, I smiled at the thought of both Thom and Beecher being with me that morning as night surrendered to the day. Sometime around 9 a.m. that morning I caught a strange movement about 60 yards to my left. I stared into the trees straining my eyes to pick apart each limb, leaf and twig. I needed to see what it was that had caught my attention. Then, I noticed a horizontal line and then a small patch of white. Slowly, a form materialized: a deer. My first thought was “where did you come from”, my second was “WOW, that is a nice buck!” I raised my binos and continued to pick apart the cover and finally managed to get a decent look at the buck. It was at least an 8, maybe a 10 with long tines and thick bases. His neck was swollen, and he was twisting a small sapling in his antlers. For the next 5 minutes, I watched him mill around. His body angled away from me, and I doubted he would come my direction without some coaxing. My only option was to blow a soft grunt from my call. No reaction. I waited till he lowered his head and tried again, this time with a bit more force. Again, no reaction. Rather than do more harm than good, I slipped the call back into my pocket and waited. After another five minutes or so passed, he turned about and headed off in the opposite direction, never coming closer than 50 yards. I immediately decided I was going to wait ten to fifteen minutes and try some light rattling. I hoped I could bring him back. Based on his gate he was in no hurry when he left and seemed to have no real purpose. So, maybe. Lightly tickling the antler tines and twisting one antler with another does not make a lot of sound. I knew it was still way too early to make much noise with the horns. I hoped it would be enough and wondered if he was close enough to even still hear me. With the horns back in my pack I stared intently into the thick cover in front of me. I wanted to see any movement that would indicate he had returned. I scanned back to my left to see if perhaps he would return using the same path he had left on. Just as I was about to start scanning back to the right I detected movement. There was a buck. Not the buck I was trying to call back but another buck had heard the sound. This new buck was coming in my direction to investigate. 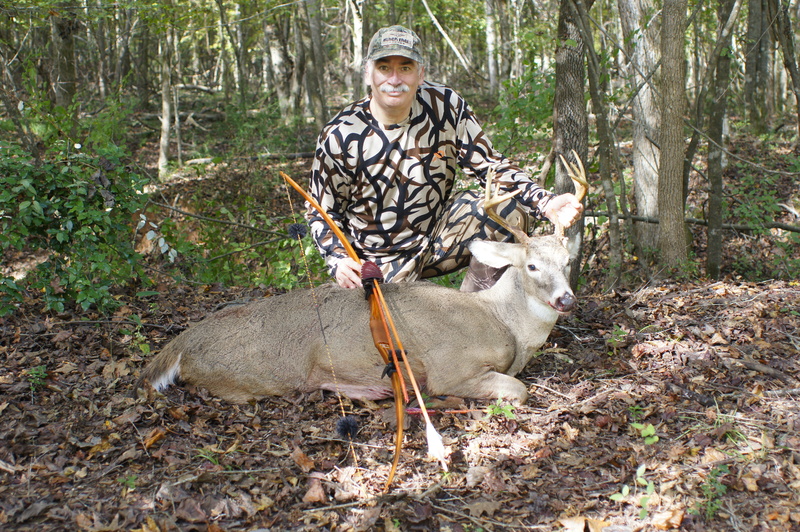 His body was large, he was sporting a medium size 5 x 5 rack and my grip tightened on the handle of my bow. I soon realized there might be a problem. If he continued on the path he is on, he would pass directly underneath my stand. Part of me worried this would result in him catching wind of me before I could take a shot. Then almost as if reading my thoughts, he turned to his right which would bring him right by the tree I was in. I was still a bit concerned though because he would be close, within 5 yards of the base of my tree. Not the best shot angle. Immediately I started going through the numbers in my head. The bow was heavy enough, the arrow even heavier at over 800 grains. The broad head was sharp, very sharp in fact. I knew what I had to do and immediately locked my stare on to a spot at the top of the buck’s shoulder blade. If he continued on his course I knew I could slip the arrow right into the top of his shoulder. The plan was formulated, now just a few more steps. Without ever taking my eye off the spot I had selected I watched as the feathers disappeared into the top of the buck. In an instant he did an about face and retreated along the same exact path I had watched him come in on. I watched him as far as the terrain would allow. I listened to the sound as heavy hooves clambered through the leaves. Then silence. My eyes immediately returned to the area of impact and there I see my arrow. The front two thirds was impaled into terra firma, the back third lying on the ground a couple feet away. Just a few feet from there I could make out the trail the buck left during his retreat. Experience tells me the trail will not be long, or difficult, to follow. Perhaps some of the most special gifts I have received are those of friendships. I have made quite a few along my traditional journey. Two close friends, were miles away from me that morning. Still, through their generosity they were both right there beside me. The best gift was not the material items they had given to me. The bow and the arrow that I used that morning. The real gift was that they will both be forever tied to the memories of that wonderful hunt on October 22, 2017. This story was published in the Winter edition of STICKTALK magazine. You can find other stories like it in the pages of STICKTALK, which can be delivered to your door four times per year (digital version also available) for a mere $20 joining fee. Not only will you get the magazine, but you will be a member of one of the finest archery organizations in the U.S.: the Michigan Longbow Association, which is the largest (and probably the only) longbow-specific organization in North America. Awesome read made me wish I was there great writing. Thank you Andy! Glad you enjoyed it!